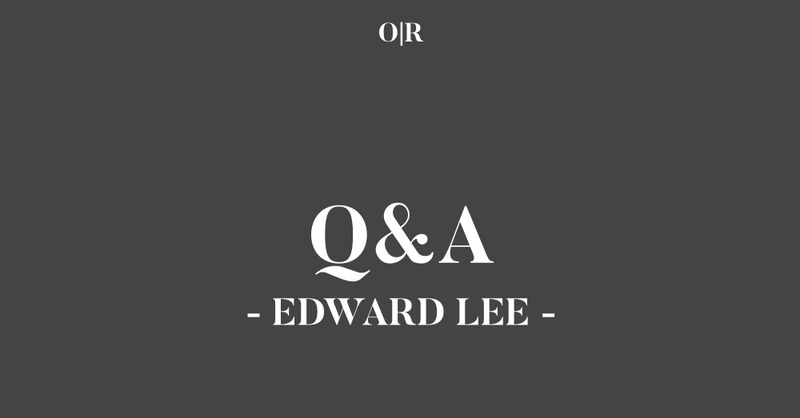 We're honored to feature poems by Edward Lee in Issue One of Orson's Review. We're also very fortunate for the time Edward took to sit down and chat with us about his journey as a poet. *The following interview involves Orson's Publishing (OP) and Edward Lee (EL). EL: As a kid I always loved to read, and like all kids I was indiscriminate in what I read. But, it was when I read the first paragraph of The Talisman by Stephen King and Peter Straub that I knew I wanted to be a writer; though, initially, a horror writer, and proceeded to write a horror novel that is best left in whatever dusty corner it dragged itself away to to die. Around the same time I was introduced to The Doors, and the poetry of Jim Morrison. There and then I wanted to write poetry like him, and started writing the teenage angst that young poets write, ‘life’ rhymed with ‘knife’, and the like; unlike the horror novel, I still have the notebooks I wrote all those poems in and some of them, after heavy rewriting, have seen the light of day in various magazines. Thankfully, as I was introduced to other poets I realised that Jim Morrison wasn’t a great poet, though I still hold some fondness for some of his poems. EL: I like to tell myself it is, or, at least, being a writer is. But my primary occupation is being a stay at home dad, my writing fitting around that haphazard schedule. Most of my writing gets done in the few hours that my daughter is in school. OP: What about "Alive" and "The Show is Over" are you most proud? EL: That I finished them. A lot of poems don’t survive beyond the rush of the first draft. EL: I do in that everything goes through several drafts, but with fiction or screenplays I sit down at the desk every day and write, no matter if I’m in the mood to or not. With the poems, I can only write them when I am inspired to write, when the first draft comes out in one long rush. Subsequent drafts, usually four or five, then regress to the sitting down and doing it, and can take between one month to six. As I said above, some poems don’t survive beyond the first draft, whatever it was that inspired them at the time now seeming lifeless and limp. Sometimes I even know as I am writing that first draft that it won’t survive a second draft but I need to write it down to get it out of my head. Occasionally a poem will get to a second or third draft then die a death, but if I’m lucky there might be a line or two that survives and becomes another poem. EL: I genuinely can’t remember. I want to say fireman, because that seems to ring a bell. I liked to draw, and that may have been a thought too. In fact I still paint now, when time and money allow, canvas and paints being far from cheap; space is a problem too. I’m fond of using a large canvas, and oil paints. Painting can take from six months to a year to finish, and with the oil paint, another month or two to dry. But, from the time I realised I wanted to be a writer, that is all I wanted to do. And it still is, though, as pretentious as it sounds to my ear, what I genuinely want to do is create, be it words on a page or photographs, paintings or music. I am happiest when I am creating something new. EL: There’s a lot you sacrifice when you want to be a writer: friendships, relationships. Opportunities. So intent was I on being a writer, I didn’t pay as much attention as I should have in school, or in college. Even in the jobs I have had, my eye has always been on writing. Of course, I wouldn’t change a thing, and at this stage, I’ve come too far to turn back, so I’ll keep at it. EL: Funnily enough, a couple of years ago I worked out that there is approximately 10,000 books published a year that I would be interested in reading. My tastes, while not as broad as when I was young, are still wide-ranging. As an experiment I started keeping track of all the books I read in a year, so last year I read 70 fiction/non-fiction books, thirty poetry collections, 31 plays, 12 screenplays, and 70 graphic novels. EL: Not in a while, unfortunately. EL: To keep on doing what they’re doing. EL: Not having done one I probably can’t answer that with any authority, beyond saying it isn’t for me. But some people who do them get a lot out of it, while others don’t. EL: Success, of course. At least enough success to keep doing it, without any need to get a real job to keep the bills paid. Yes, success. And recognition. EL: I will keep writing until my dying day, no matter the level of success I might achieve. Even if I never have another thing published I will keep writing. It is a part of me. Edward Lee's poetry, short stories, non-fiction and photography have been published in magazines in Ireland, England and America, including The Stinging Fly, Skylight 47, Acumen and Smiths Knoll. His debut poetry collection Playing Poohsticks On Ha'Penny Bridge was published in 2010. He is currently working towards a second collection. Be sure to check out Edward Lee's poems in Issue One of Orson's Review.